I live in a textured place. Nothing dramatic or showy, but interesting. Hills here, watercourses there, ledge all over the place: it adds up to very few straight roads and not nearly enough bridges for convenience. 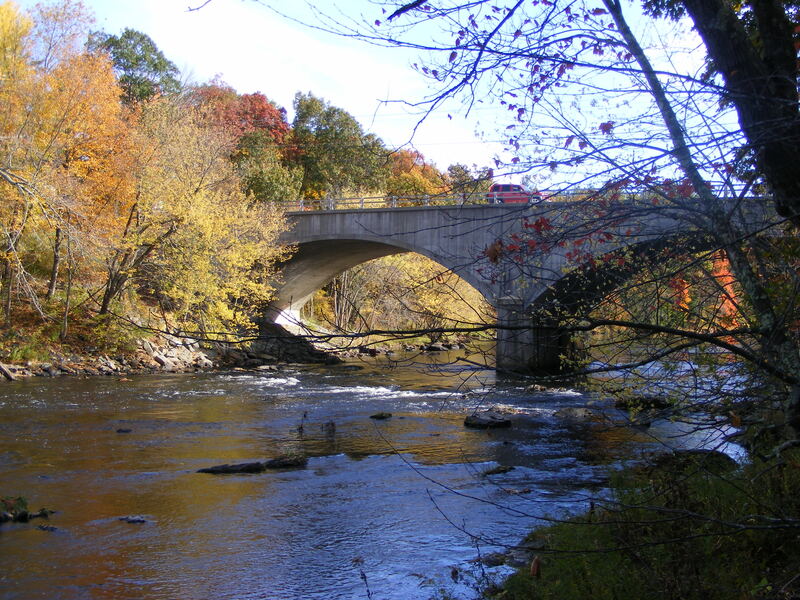 The Nashua River in southern New Hampshire could use a few more bridges, and if you don’t believe me, try driving through Nashua during rush hour. Hollis, the next town upstream, is a much quieter place. It gets by quite comfortably with one bridge over the river, connecting a small quiet town with a much busier one. There’s something about this bridge, though, that speaks to me less about connection than about rest and pause. I wouldn’t be surprised if someday I saw a sign here saying Don’t be in such a hurry to get from here to there. Stop awhile. Great picture. I can imagine being there on a beautiful fall day. Thanks! The time I know I’ll be spending shoveling snow and chipping ice over the next few months is a cheap price to pay for being here on a day like this. Oh Ellen, we are getting our first 19 degree day. I am not excited about freezing my fanny off for the next several months. I loved reading about your hikes in NH. I have been on many of the trails you mention here on your blog, though not too many up north. We live in a beautiful state! I haven’t read through every post but was wondering if you’ve ever walked through Monson Village in Hollis/Milford. I like that one! Purgatory Falls is great too. We have wonderful places to hike here in NH. It was nice reading about them here. One of my friends is an avid hiker and I’ll have to tell her about your site. She’ll love it! I haven’t been to Monson Village yet, but I’m looking forward to discovering it! I like Purgatory Falls. Last time I was there, I was with a friend and her two dogs who ran circles around us all the way to the top. I wish I had their stamina. Thanks so much for reading! In the marshy section of Monson Village I was captivated by the large heron nests with the baby herons poking their heads out 🙂 There are so many nests! A woman I met while walking through said that they are there every year. I plan on taking my daughter next summer – she’ll love the herons. Plus, it’s a good history lesson for her. I wish I had the stamina of my dogs too!